Wine wizard to the stars returns to pop a few corks on home turf | News by Wales Express News, People Before Profit! 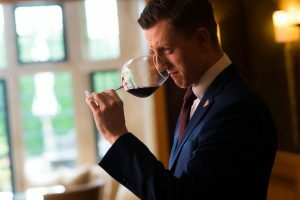 One of the UK’s youngest head sommeliers who has served stars like Sir Tom Jones and Coldplay frontman Chris Martin will be sharing his wine expertise at Llangollen Food Festival. It will be quite the family affair for Dan Davies, 22, will be joining his father, festival stalwart Dai Chef, who will also be assisted by younger children Megan, 12, and Ellis, seven, for a cookery demonstration. The event, which is celebrating its 20th anniversary this year, has been named as one of the Top 10 food festivals in the UK by the Daily Telegraph and Independent newspapers. It’s being held at the iconic Llangollen Pavilion on Saturday and Sunday, October 14 and 15. Dan, who was brought up in Chirk and is currently head sommelier at the two-Michelin starred Whatley Manor Hotel in the Cotswolds, has also served two of the biggest names in the culinary world, Michelin-starred chef Heston Blumenthal and the queen of cakes, Mary Berry. Now, he is looking forward to returning home to North Wales and helping visitors discover some exciting homegrown wines. He grew up attending the Llangollen Food Festival and although he wasn’t old enough to remember, he met legendary operatic tenor Luciano Pavarotti in 1995. At the time his dad was working at the nearby Bryn Howel Hotel and spent a week as the opera superstar’s personal chef when he made an emotional return to the eisteddfod, 40 years after he had first competed there as a 19-year-old member of the Chorus Rossini choir from Modena, Italy in 1955. Daniel, said: “I don’t remember seeing Pavarotti but I’ve seen the photos of me in my chef whites standing next to my dad! “It’ll be nice to come up. I’m looking forward to having a bit of fun and speaking about wine. “I work most weekends so it’s exciting to do something a bit different. “I’ll be matching wines to dad’s meals – they will be a selection of Welsh and English wines. “Hopefully people will discover some new wines and see what we’re capable of producing in Britain, which is high quality wine. “Wine over here is really flourishing. The Germans, for example, are keeping a really close eye on our wine, particularly with the climate change. “It’s a really exciting market – one of the fastest growing for wine in fact. Daniel, a former pupil of Ysgol David Hughes in Menai Bridge, Anglesey, has been by his dad’s side most of his life but was never destined to follow in his footsteps as a chef. He said: “I wanted to be an air traffic controller when I was 16. I was learning to fly but never ended up getting my pilot’s license. “I was always in the kitchen with my dad which funded my flying at the time. moved on to the five star Cliveden House Hotel in Berkshire where he was introduced to the wine profession – and has never looked back. Daniel explained: “I was teetotal at the time but it’s safe to say I’m not anymore! “It all started from there really – I fell in love with the subject. I love the challenge and puzzle involved. “I’m really enjoying my current role. I work in lovely surroundings, very pretty. “There are a lot of vineyards in the area that I can visit and I also try to get to London as much as I can for wine tasting events. Working as a sommelier since 2013 has resulted in Daniel rubbing shoulders with some very high profile names. “Sir Tom Jones was a regular at Stovells – a Mexican restaurant that I worked at in Surrey”, he explains. “He must have come in five or six times. He wasn’t a big drinker but he always knew what he wanted. “I’ve also served Heston Blumenthal and Mary Berry. Heston had really good knowledge and liked to chat. He’s more into his classical wines. “Then there was an occasion when we had Chris Martin at the Cliveden. I try not to interact too much because they’re in their bubble and want to enjoy their night. Proud father Dai believes his son will become a Master Sommelier by the time he is 40, which is the highest accolade possible and a rare feat achieved by only a few hundred people around the world. He said: “Daniel has got such knowledge of wines, it’s unbelievable. “He’s been in the kitchen with me all his life. He ran the Ship Inn when he was just 16. “I always said he was too nice to be in the kitchen so I put him out front and he was made to be with people. Dai is looking forward to working with his family, or ‘Team Dai Chef’ as he refers to them, and will be rustling up a series of meals from the latest culinary craze at the festival. He explained: “We’ll be doing a live workshop on stage. This year we’re going to be doing ‘clean eating’. “Dan will be matching the wines to the dishes we do on stage. It’ll be innovative and hopefully people will like it at the show. “There is a big call for clean eating with lots of new places popping up. It is a challenge to keep moving with the times but you have to keep yourself ahead of the game. “Clean eating is massive in Vegas and New York, and is big right now in London. It’s just starting to spread from there. Dai added: “Dan is very much customer first whereas Megan is like me – she has kitchen attitude! “She’s been doing cookery demonstrations since she was five and will be serving up some Greek flatbreads. Dai, who has cooked for Catherine Zeta Jones and the House of Lords during his long, distinguished career, is a regular at Llangollen Food Festival. He is now working as a freelance and consultant running meal services for private functions. “I celebrated my 60th birthday this year and I’ve already visited 30 different restaurants”, said Dai. Phil Davies, a member of the committee at Llangollen Food Festival, said: “We’re delighted Dan is returning to Llangollen Food Festival where he’ll be joining his dad, the ever popular Dai Chef, and his family for a culinary masterclass. “This year is going to be a very special as the festival is celebrating its 20 anniversary so, with advice from Dan, we will be raising a glass or two to mark the occasion. Next articleOh baby, what a great idea!